Glovius version 2.0 for Windows is now available! We are very pleased to announce the latest release of Glovius. Glovius for Windows release 2.0 is now available for download. The new release incorporates various new features and bug fixes. All file formats supported using the Importer add-ons now support saving to the lightweight JT format. Glovius supports most of the popular cad formats, including SolidWorks, Inventor, CATIA V5, Pro/ENGINEER, STEP, IGES & NX. With Glovius 2.0, you will now be able to save your CAD format parts and assemblies to the lightweight JT format for further use. Point snapping is now supported while doing measurement in the Glovius. The snapping and visual cues will help users to do simple point to point linear measurements quickly and accurately. Snapping support is available for all CAD formats, and for JT files with version 9.5. Support for lower versions of JT is coming soon. Print & print preview functionality is now available in Glovius. 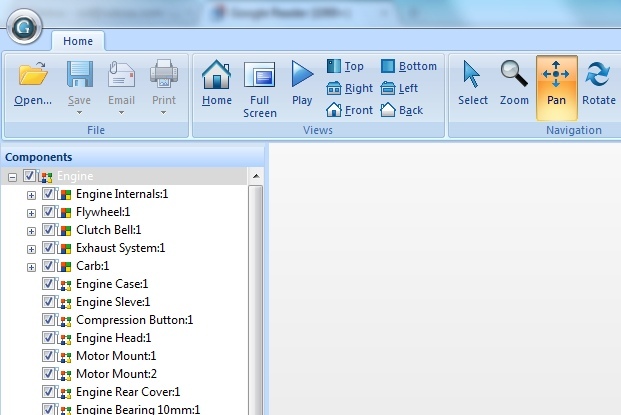 Click on the print icon to bring up the system print dialog. You can also preview the active document before printing your 3d model. With Glovius 2.0, it is now even easier to try and evaluate the many add-ons available on Glovius. Simply download and install an add-on. Next time Glovius is launched, the add-on is configured for trial. It is as easy as that. Glovius 2.0 sports a much cleaner Office 2010 like ribbon interface. All the commands are clearly visible and there are no context menus or hidden items for you. The Office 2010 like ribbon, makes Glovius familiar for most of the users.